Cheesemaker Reto Güntensperger grew up in the historic Bodmen dairy, his bed mere steps from the room where his father & grandfather crafted Appenzeller by hand in their 1,500 liter vat. 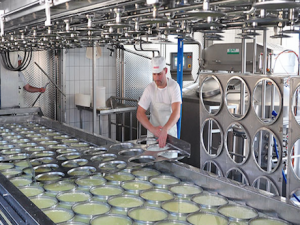 By 1999, his father and two brothers moved operations into the village of Butschwil below, purchasing the fallow dairy and rebuilding it, expanding their family business as their own children grew into the company. The dairy is now a model of balance between modern efficiency and time-honored tradition. As Appenzeller quotas (overall association production capacity) have reduced in recent years, Reto and his father have partitioned their milk supply, sending the 75 lower altitude farms’ milk to their Appenzeller production and using the remaining 50 Bergmilch suppliers (whose Brown Swiss and Braunvieh herds average 10-30 cows) for their own recipes. Columbia Cheese is pleased to present these cheeses to the United States for the first time.